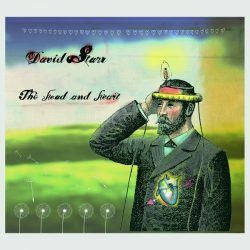 Americana singer-songwriter David Starr, with a well-received tour of the UK and a new 6-track under his belt, finds his reputation as a performer has taken on another dimension. Such is the quality of the recording I find it hard to accept he isn’t a bigger name. Then again, that goes for a number of acts, and vice versa regards those hailed as stars, in reality nothing special on the Americana (or otherwise) scene. Depending largely on word of mouth, Starr is a most articulate singer-songwriter. His work is steeped in the fertile soil of America’s finest, his worldly thoughts are of a kind to seep into one’s subconscious that become greater with every listen. Starr’s music is of the kind best heard without too many distractions to undermine the great beauty. The album is produced by John Oates of Hall & Oates fame and it is the first time Starr’s taken the decision not to handle the duty in-house. In doing so it has freed him to breathe more easily, and experiment with the songs and ultimately press ahead. In I’ve Come To You with its relentless rhythm Starr has a song set to become a big one for him. It is one of those songs a host of people could well take to their heart (and for his sake, hopefully record), and with hints of among others, another fine singer-songwriter, Texas act Darren Smith, Dancing With My Pride ticks all the boxes. Tender and moving, The Edge Of The World opens the EP nicely enough, before his work moves up a notch or two for the exquisite The Head And The Heart and with a lot of guile, he bravely covers the Mamas & The Papas’ 1960s hit California Dreamin’ without its age old trademark harmonies, but with a more steely fashion. Oates, who plays acoustic guitar and sings harmony vocals on the track is also responsible for the imaginative arrangement of cello, pedal steel and an excellent rhythm section that presses forth in determined fashion. It is well worth noting the players lending support on Starr’s 8th release. For you have Nashville heavyweights (not the kind of people to turn up at any old recording) in Dan Dugmore, Nat Smith, Greg Morrow, Steve Mackey, Tom Bukovac and Oakes to go with Starr’s fine work on acoustic and electric guitar. Starr doesn’t only play guitar, but in fact the Arkansas -born performer also owns his own music shop in Cedaredge, Colorado.